Universal design means being inclusive when you design and build rooms—if you design for yourself, it will only work for you. When we installed the five-piece shower unit in the Model Remodel, Bestbath sent two people to talk us through it: Greg Wells, marketing director, and Marcus Cook, regional sales manager. They were both very helpful and a lot of fun to spend the day with. Marcus has installed about a jillion of these units, so he answered all of Ben’s questions about prepping, installing, and finishing before and during the prepping, installing, and finishing. One of the most dangerous actions in the bathroom for people with limited mobility is stepping over a tub or other obstacle. This can be especially bothersome for children and seniors. Designing a shower to be barrier-free is safer for all people who use the shower. Planning ahead can look good, too. 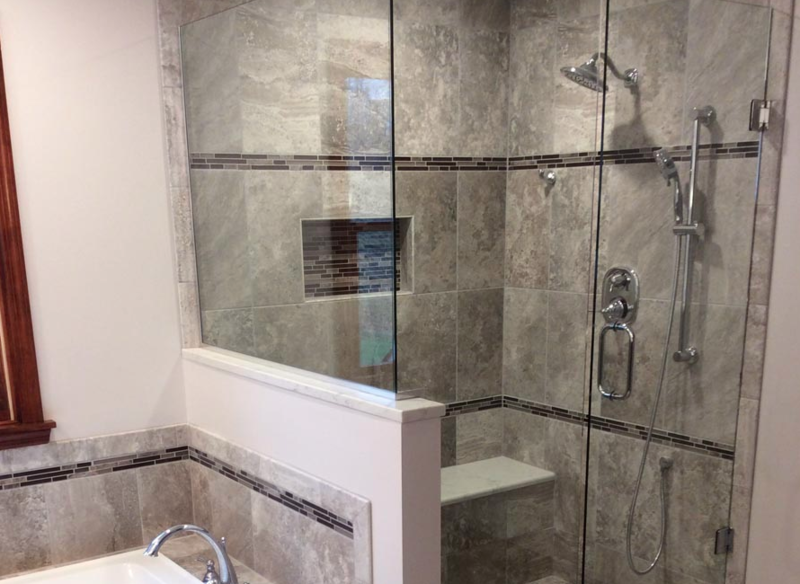 More people are choosing barrier-free showers for their sleek modern look. People in wheelchairs need space to maneuver and move around. A 5-foot diameter circle gives enough room for a 180-degree turn. Planning ahead now will sure make this easier if ever needed. Plus, it makes the bathroom larger, a feature more homeowners today want. It makes sense to use a three-foot door into a bathroom and it makes sense to do the same into the shower. Using a wide door makes it easier for people of all abilities to access the shower. By the way, if that earlier-mentioned three-foot entrance door is a pocket door, it will never swing toward someone. A handheld showerhead is vital for people with limited movement. A typical 60-inch hose allows the shower head to be used while seated, and it can also make cleaning the shower easier. Ideally, the handheld showerhead will be mounted to a vertical pole making its stationary height adjustable to the user. Grab bars can prevent slips and falls. People of all shapes, sizes, ages, and abilities appreciate a sturdy bar to grab when stepping into and out of a sloped wet area with wet feet. It is easy to find a style to suit many decors, and they can double as towel bars. Useful for all ages, shower seats can be used for propping up a foot while shaving or washing, storage for lotions and potions, and for sitting. It’s nice to select a shower seat that can fold away when not needed. A lot of injuries occur when stretching to reach the soap or shampoo. Placing shelves, niches, and accessories at the correct heights and distances reduces reaching for slippery stuff. ●For a more in depth look at some of these items, see my article on ProTradeCraft. ●For more about installing Bestbath shower surrounds, see their videos on ProTradeCraft.